It can patrol your entire house, as long as you don't have stairs. 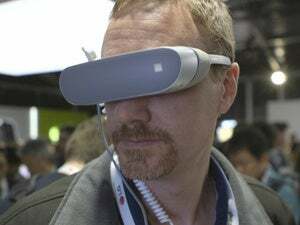 One of the most fun smartphone accessories to come out of this year’s Mobile World Congress expo has to be LG’s Rolling Bot. 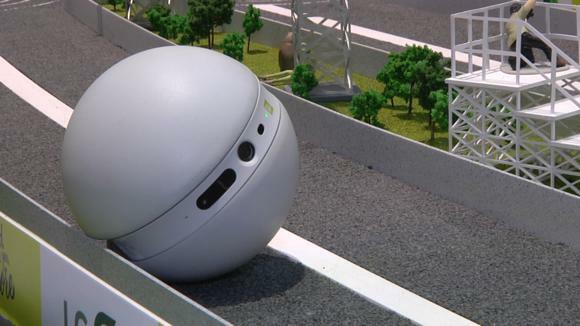 It’s a spherical ball that rolls around on command from a smartphone, and includes a camera and laser pointer. The bot can be controlled locally or remotely and is envisaged to be kept at home. When you’re away, you can remotely trundle around the house and check everything is OK via livestream—well, at least until you reach the stairs. LG also thinks it might be up to the task of entertaining your pets when you’re not at home. To that end, there’s a laser pointer embedded in the bot. Anyone with cats knows they go nuts when they see a spot from a laser, so LG might be onto something with this idea. At first glance—if you have a good memory—it’s a little reminiscent of Sony’s Q-Taro. 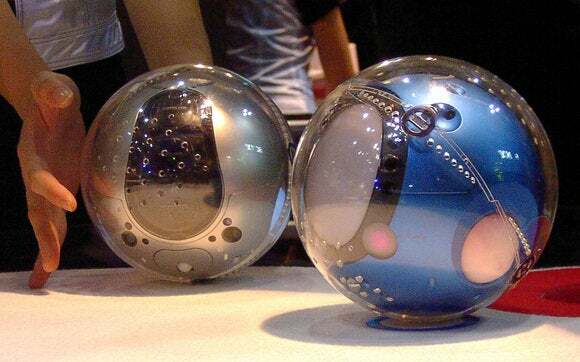 Sony’s prototype Q-taro, which reacts to its surroundings, on show at Robodex in Yokohama, Japan, on March 27, 2002.